Whenever I see articles about national or global conditions in real estate, I take them with a grain of salt. Why? Because real estate, whether it is residential, industrial, office, retail or whatever, is a LOCAL market. Conditions in one market may be totally different than others, and if you're in that particular market the national statistics don't amount to a hill of beans when it comes to describing YOUR market's condition. For instance, in the subject article comments like "There was less overbuilding in the industrial sector" made me chuckle. The Reno/Sparks market saw a you-know-what load of overbuilding during 2005-2007, particularly from developers new to the area using OPM. Some of us ruminated about the consequences of this unbridled construction in the face of historic absorption, but we're just brokers...what did we know. The resulting 15.5%+ vacancy rate that resulted is the highest ever recorded and devastated industrial construction; the Associated General Contractors named the Reno/Sparks area the hardest hit in the nation. The article does reference individual markets...Houston, Dallas and Los Angeles to name a few, but these are primary markets and, although they may represent a portent of things to come, they have totally different dynamics than Reno/Sparks. Nonetheless, although the article doesn't reflect conditions here, we can hope it is a portent of a brightening global picture, which eventually will filter down to our little corner of the world." Industrial lease lengths are shortening. A few years ago, average lease length in the Reno/Sparks industrial marketplace was 5 years. Now days, tenants in need of space are requesting shorter term leases. Two large (176K & 165K) leases were completed last year at very low rental rates on a month-to-month basis with either party able to give the other party 60 days written notice to terminate. Early this year a 240K month-to-month lease was concluded. In addition, there are two more large leases being negotiated on short term leases. Under the current market conditions, short term leases are viewed as favorable to both the landlord and tenant. Tenants are justifiably nervous and like the shorter commitment to enable them to be nimble in the event of a double dip in the economy. Landlord like the short term because they are hesitant to lock in low rental rates. Landlords can live with a temporary fall in value which has potential to remain temporary if the term is month-to-month but the loss is locked in on a 5 year deal, the landlord has just guaranteed a long term devaluing of his building by locking in a low rent. The value of a building is predicated upon the income stream. A long term low rent lease guarantees a long term devaluing of the building. Another positive for a landlord is the tenants are in a poor position to ask for up front improvements with a short term lease which could save the landlord up front improvement costs. With lenders shying away from tenant improvement loans and questions still lingering through the Reno industrial market regarding the “recovery”, short term deals remain in vogue. In the last 18 months vacancies have continued to decline in hospitality and multifamily properties alike. Migrant workers in the construction industry as well as many other families, who suffered job losses and had no prospects for employment, have simply left Reno and the state of Nevada in general. Multi tenant property owners and managers are now faced with the ever increasing challenge of keeping stringent tenant criteria with the need to maintain an occupancy rate that makes sense and services operating expenses. It can often feel like a game of cat and mouse or catch rather than business strategy, but like all games, in order to win you must deploy a winning strategy. 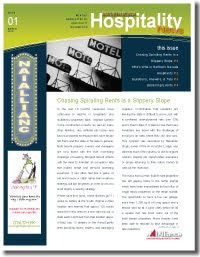 Download a copy of the NAI Alliance Northern Nevada Hospitality News for March 2010 today.